The city of Kamakura, about 30 miles (50km) southwest of Tokyo, at the base of the Miura Peninsula, was the political powerhouse of Japan in the middle ages and the seat of government for most of the 13th century. Because of its historic importance, Kamakura boasts numerous monuments, temples, and shrines which are of interest to sightseeing tourists. As an added bonus, the city sports some sandy beaches and good hiking trails in the nearby wooded hills so that a day or two can be spent very happily in the city enjoying both the natural and historical attractions. Kamakura's many sights are too numerous to detail individually, but most important of them all is the Great Buddha. This bronze statue of the seated Amida Buddha is located in the grounds of the Kotokuin Temple and, standing at almost 44ft (13,35m) high, it is the second largest Buddha statue in Japan after that found in the Todaiji Temple in Nara. 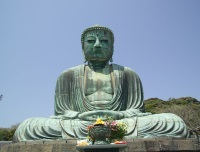 The Kamakura Great Buddha was cast in 1252 and was originally contained in the temple hall. A tidal wave (tsunami) washed away the temple in the late 15th century, but the Buddha prevailed and has since stood triumphantly in the open. Kamakura is a very popular daytrip from Tokyo, but many visitors will find that they want to spend at least one night in the city to fully appreciate all it has to offer.